The Telangana government has been going overboard to placate the Muslims in the state, much at the cost of other communities, which would, clearly, not only distort the political discourse but also sow seeds of discord. The driver of a vehicle must be cautious and careful. Even a small error is a potential danger to life. By announcing Urdu as the second language of Telangana, Chief Minister K Chandrashekar Rao (KCR) has committed a blunder that is bound to influence generations to come. Not just this, some of the other major decisions taken by Telangana government in recent times can be termed bluntly as minority appeasement for purely political gains with scant regard to the overall well-being of the state. On November 9 KCR designated Urdu as second official language of Telangana. He announced that 900 Urdu teachers would be recruited soon by forming a special District Selection Committee (DSC). The eligibility criteria for these posts will be framed by the Urdu Academy and the Minority welfare department. The deadline for the recruitment is 70 days and to be executed on top priority basis. KCR has also provided for induction of 66 Urdu-speaking officers into various key departments in the government. The State Assembly, Council Chairman, Chief Secretary and the 17 other ministers will have one Urdu -speaking officer assisting them. Likewise, the assembly administration, State Council, Information and Public Relations Department, Office of the Director General of Police (DGP), the Hyderabad City Police commissionerate and all the newly set up 31 district Collector offices will have exclusive Urdu speaking officers to receive petitions from the public. Imposition of Urdu as the second language in Telangana is KCR’s latest spectacle among the slew of audacious largesse he has granted to appease the Muslims in the state. He had recently proposed to construct Hyderabad International Islamic Cultural Convention Centre of international standard in an area of 10 acres in Kokapet on the outskirts of Hyderabad. He has also decided to set up a separate industrial corridor for Muslims which is in direct contrast to the democratic principles of the country. Telangana government has also increased the quota for Muslims in jobs and education from 4% to 12%. The Telangana Minorities Residential Educational Institutions Society (TMREIS) is planning to set up 120 schools at the cost of Rs.6723 Crores. 71 such residential schools (39 Boys and 32 Girls) are already functioning and remaining are likely to come up in later phases. 75% of the seats are reserved for the minorities in these schools. Urdu is a compulsory subject for Muslims while non-Muslim students can opt for Telugu. The Chief Minister’s Overseas Scholarship Scheme for Minorities introduced in 2015-16 grants Rs.10 Lakhs per Student and one-way Airfare to those minorities travelling abroad for higher education in foreign universities. A Telangana Minorities Study Circle was also formed for 2015-16, which will focus on training minorities Candidates for competitive exams conducted by TSPSC. It is also sponsoring 100 minority candidates who are preparing for All India Services Exams from the country’s top Institutes every year. Officially, all the above initiatives come under Minority welfare schemes but are aimed at strengthening the Muslim vote bank for the ruling party. Official records say that there are already 1,561 Urdu-medium schools in the State with about 1.31 lakh students. The current Urdu academy in Telangana is occupied in organising Haj programmes and religious seminars. The Urdu academy is not equipped to do any academic work .We already have a number of examples across the country where fanatics from Islamic seminaries are seen and heard sowing the seeds of separatism and refuse to abide by the law of the land. If a school going kid is fed such venom by fanatics, the result is bound to damage the social fabric of the state and country. Till date there has been no proof of any contribution of any madrasa to science and technology. On the contrary, Madrasas have contributed immensely to the establishment of theological states across the Arab lands and in Asia too. If these are the antecedents of Islamic schools across the world, what kind of research would an Islamic centre in Hyderabad conduct? The historical evidence is simple and clear. It will be another institution supplying Islamic doctrine to schools and colleges. In the coming decade, voices of separatism would have grown with the sanction of the government and funded by the Telangana public! Chances of this scenario transpiring is high because there is none to verify the content and monitor the developments of such schools. The language barrier will pose a big challenge to the government officers thus forcing them to agree to requests that are in Urdu. Leaders like Owaisi can easily hijack these schools to suit their own narrative and paint a favourable picture of the Nizam and Mughuls in the history books of such schools. Chief Minister Chandrashekar Rao himself has always been reluctant to accept the atrocities of Nizam and the Razakars during the accession of Hyderabad in 1948. These kinds of appeasing actions by Telangana government will only sow the seeds of Muslim separatism. A separate Industrial corridor for Muslims may be on paper today but will soon be pushed as an agenda for the 2019 general elections. In October, Ambassador of the Kingdom of Saudi Arabia Soud Mohammed Alsati expressed willingness to invest in Telangana. With such religion-based investment coming in, the ramifications for Telangana and the country as a whole are huge. KCR’s promise of an exclusive industrial corridor for Muslims will give rise to other demands. Since such a corridor would mostly accommodate students literate in Urdu, Muslim investors could demand a “separate” welfare fund for Muslims and later insist on Islamic Banking too. The Khilafat movement, supported by M.K. Gandhi, resulted in furthering the Muslims separatist agenda and resulted in the partition of India. Such slew of measures by a state government to appease the Muslims would result in rekindling separatist tendencies again. We can recall that MIM party head Assauddin Owaisi initially opposed the idea of a separate Telangana but agreed to support the cause only when his demand to include Kurnool and Ananthapur districts, both with a high percentage of Muslims, were included as part of the new state. Measures aimed at pampering a community are bound to sow the seeds of discord in the society, creating deep chasms and spoil the social fabric. Instead of attempting to bring the madrasas into the mainstream with emphasis on science and modern computer-based education, the Telangana government is running in the opposite direction. Arabic style of dressing in Hyderabad, increase in burkha clad schools kids are manifestations of cultural assertiveness which further alienate Muslims from the mainstream. Similar appeasing measures, in the garb of secularism and Muslim identity, attempted by the erstwhile SP government in UP had almost alienated the Muslims of the state and hence this year the UP Government, led by Yogi Adityanath had to force the madrasas to celebrate Independence Day. Telangana could follow suit if remedial measures are not taken soon. Recently, AIMIM leader Akbaruddin Owaisi proactively proposed that his party will form an alliance with TRS in the 2019 general elections. By the time nationalistic forces are strengthened in the state, the separatist elements could gain a strong foothold. Any attempt by the central government to thwart their efforts will be showcased as being anti-Muslim. Decisions of Telangana government aimed at appeasing the Muslims could lead to serious damage to the society in the coming days if they are not effectively countered by every concerned citizen, party or organisation. This entry was posted in Nation, Threats and tagged CM of Telangana, Muslim appeasment in Telangana, Telangana on November 24, 2017 by arisebharat. Telangana’s Chief Minister Kalvakuntla Chandrashekar Rao (KCR) announced in the state assembly day before yesterday (18 January) that his government will table the long-pending bill to triple reservation for Muslims in education and employment, from the current 4 per cent to 12 per cent, in the upcoming budget session. Additionally, he told the house that he was planning to arm the Wakf Board in the state with judicial powers. Let’s look at these two issues, how they have panned out so far and why this pandering to Muslims is dangerous, and not just in the constitutional sense. The chief minister has been very keen on increasing quotas for Muslims — it was a key poll promise during the 2014 assembly elections after all, so much so that he wanted to pass the quota bill in a special session of the assembly last year, which was convened in August to ratify the GST constitutional bill. However, his decision met with procedural roadblocks. Telangana didn’t have a Backward Classes (BC) commission back then. Only the commission of inquiry had endorsed the idea. Which wasn’t enough. Only a BC commission can “increase or decrease quotas or make additions or deletions on eligible castes”, as KCR’s BC welfare minister put it at the time. On 15 December, the commission initiated public hearings on the matter and received about 52,000 representations, most of which supported the enhancement in Muslim quotas, as indicated by the commission’s Chairman B S Ramulu. By the time the budget session begins next month, the commission in all likelihood would’ve submitted its report. It is ready and endorses the Sudhir Commission recommendations. The commission members are waiting for an appointment with KCR. Congress, Telangana Rashtra Samithi (TRS) and Majlis-e-Ittehadul Muslimeen (MIM) have also given official representation to the commission supporting the increase in the quota. KCR says he is enhancing reservation for Muslims not on religious grounds but on their socio-economic conditions and educational backwardness. This line of argument is obvious. Quotas based on religious grounds are unconstitutional, and will not stand scrutiny in court. So will KCR succeed in his enterprise? One can’t be sure given the myriad ways in which jurisprudence in the country works. The legal system is confused. In 2004, Y S Rajasekhara Reddy’s Congress government had enshrined 5 per cent quota for Muslims, taking the total reservation in the state to 51 per cent. This was struck down by the Andhra Pradesh high court citing the 49 per cent constitutional limit for quotas. Cleverly, the Reddy government changed the quantum of quota to 4 per cent. This was also deemed unconstitutional by a seven-member bench of the high court. When the matter reached the Supreme Court, it passed an interim order staying the Muslim quota until a separate constitutional bench decided on the matter. The case is still in progress. KCR wants to avoid the whole legal tangle. He plans to go to the centre directly and ask the Modi government to put the state’s law into the ninth schedule. Laws in the ninth schedule are protected from judicial review. But the centre is unlikely to play ball. The chief minister has his plan sorted out. He will cite Tamil Nadu’s example. If it can give 69 per cent quota, why can’t we, goes the argument. KCR’s confidence (100 per cent, no less) in the ‘rule of law’ is really charming. If he wants to pin his hopes on the apex court’s wisdom, he needs to get in line. Haryana government also wants to put the Jat quota in the ninth schedule. And more important, the 69 per cent quota in Tamil Nadu is not the final word. The matter is still sub-judice. KCR’s insatiable thirst to appease Muslims doesn’t end with a substantial increase in their quota in jobs and education. He also wants to give judicial powers to the Wakf Board. He is wooing the youth of the community with the former, and Mullahs with the latter. His government will introduce a bill in the next session empowering the board. ‘Wakf land is being illegally grabbed’ is the justification behind the move. While he is right on the encroachment of land (out of 1.3 lakh acres in both Andhra Pradesh and Telangana, the Wakf Board claims that 81,000 acres of land is encroached upon), by giving judicial powers to the board, he is barking up the wrong tree. “A huge extent of Wakf lands have been encroached upon in the city and districts during the undivided AP government. Several land cases have been lying pending for years. Due to the lack of judicial powers, the Wakf Board is not in a position to initiate action against land grabbers or resume lands. We will soon give judicial powers to Wakf Board.” (Source: Deccan Chronicle ). Very touching indeed. How can the state give power of adjudication to one participating party in a legal battle? This is akin to giving judicial power to an alleged victim over the alleged accused. This is nothing but a step towards injecting Sharia-like laws in mainstream Indian jurisprudence. KCR’s plans threaten to turn the whole idea of the legal system on its head. But let’s excuse KCR for his outrageous proposal for a second and talk about the rule of law, equality before the law and equal protection of law. Applying his own logic (If Tamil Nadu can give 69 per cent quota, why can’t we? ), shouldn’t he give the same judicial powers to temples? There are 20,000 temples in the state (5,000 of which have prominent properties). These temples have about 86,000 acres of land, but more than half of it — 56,000 acres — has been encroached upon. Certainly, they also qualify to be given judicial powers? But surely, the courts would stop KCR from pursuing his openly communal and common-sense-free politics? One shouldn’t hold one’s breath. Remember, these same courts have allowed communal laws like the Right to Education (RTE), which only applies to non-minorities (mostly Hindus), and given constitutional backing to bodies like the National Commission for Minority Educational Institutions (NCMEI), which by law cannot have Hindu members. These same courts let the Sonia Gandhi-led United Progressive Alliance government overturn their own judgment in the Inamdar case (2005) by passing the 93rd constitutional amendment which sowed the seeds of sectarianism in the education sector. But all is not lost. Yesterday (19 January), the Supreme Court ruled that churches do not have power to grant divorce decrees, only civil courts do. This means the Indian Divorce Act, 1989 will override the Christian personal law. One hopes that the courts will not let KCR run roughshod over the rule of law. PS: On top of it all, KCR has also increased honorarium for imams and mauzams from Rs 1,000 to Rs 1,500 per month. He has also announced that the state government will bear the cost of all self-financing courses in minority degree colleges. Nehruvian secularists were outraged when KCR allowed his guru to sit on the chief minister’s chair for a few seconds (which was mere symbolism), but are nowhere to be found when he is openly flouting the basic tenets of secularism. That’s why they have lost credibility. But rest of us must speak up and make it count. This entry was posted in General, Nation, Threats and tagged Congress, Majlis-e-Ittehadul Muslimeen, MIM, Muslims, Reservation, Reservation for Muslims, Right To Education, RTE, secularism, Sudhir Commission, Telangana, Telangana Rashtra Samithi, TRS, Wakf, Wakf Board on January 20, 2017 by Swadhyaaya. 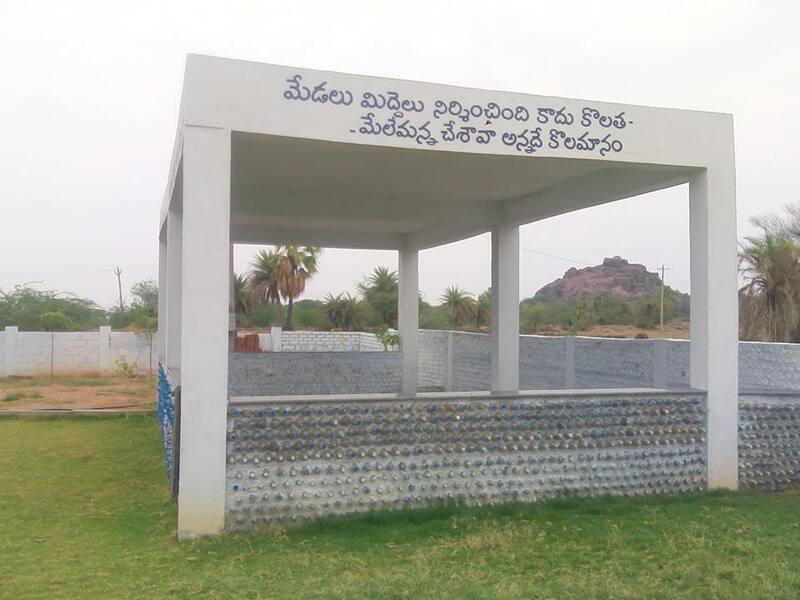 By constructing a common cemetery for all castes, Metpally village is one step ahead of other villages in social harmony (sāmarasata). 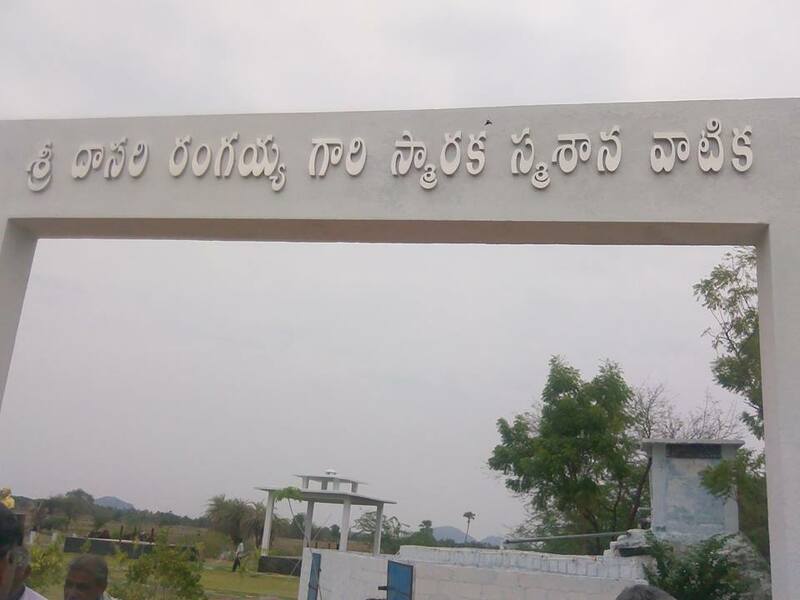 All castes share a common cemetery in Metpally (chinna) village, Keshavapatnam mandal, Karimnagar district. By allowing all the opportunity to enter into Siva’s ground, the village elders have inaugurated a movement to create social goodwill in all, which is unmatched in the history of the state. Like many other villages, they have demonstrated splendid ideals by taking a step forward, at a time the tangled knots of untouchability in Hindu society are being loosened. The sub-inspector of Husnabad, Sri Bhoomaiah, Sri Tummala Sriram Reddy were the chief l eaders of this divine activity. At a time when caste divisions are playing into caste politics, for providing a common facility for last rites to everyone, they alloted 20-30 kuntas, spent Rs. 20 lakhs, and built a cemetery that looks like a beautiful park. The facility is large enough to allow two cremations simultaneously. While cremations normally cost Rs. 15,000, here the cost of a cremation is estimated at only Rs. 5,000. With contentment, one can watch here the rites that enable the departed soul to reach an auspicious end. 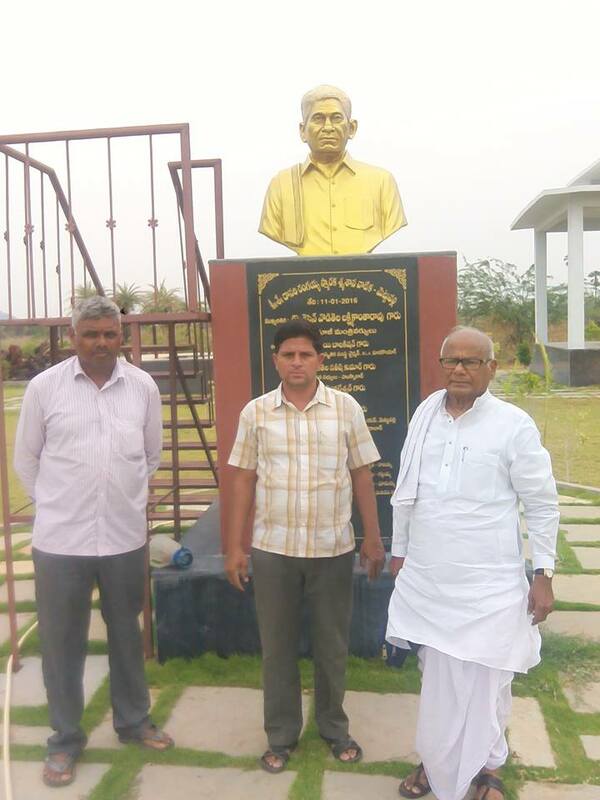 The daily upkeep and organisation of the facility are being looked after by Sri Satyam, who runs a mechanic shop, Sri Ravi, Sri Ellareddy and other close companions. The cemetery was inaugurated in February, 2016, this year. It has witnessed so far (till June) nine cremations including those of two from Scheduled Caste community. Arrangements have been made for water for bathing and for wood so as to avoid inconvenience to the users. In his Vijayadashami address in 2015, Sarsanghchalak of RSS had called for Hindu society to work towards ensuring that all HIndu have common access to temple, cemetery and water sources. Metpally village stands as an example in that direction. This is #Hindutva in action. 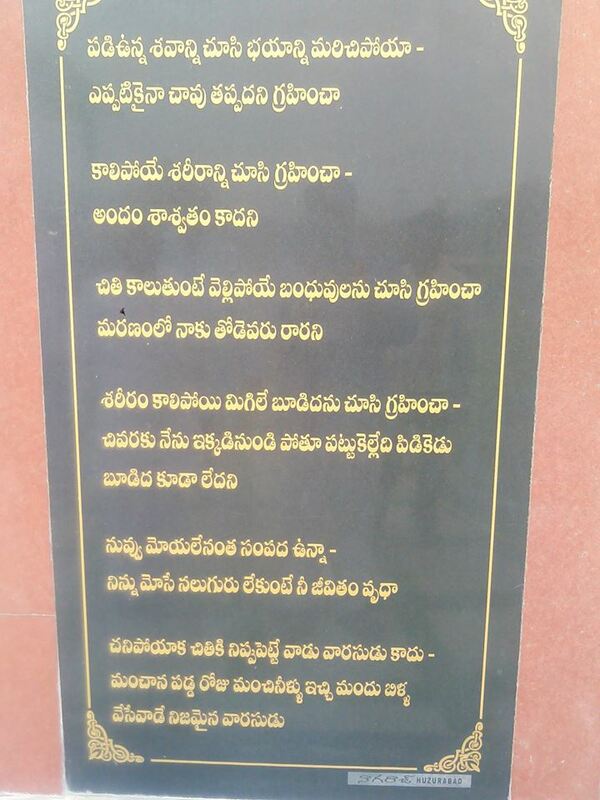 This entry was posted in Nation, Seva, Social Issues and tagged Hindu common cemetery, Hindutva, Metpally Village, Social harmony, Telangana on June 10, 2016 by arisebharat. The Anti Terrorism Squad (ATS) has arrested three people from Nagpur airport for trying to join Islamic State (IS), according to media reports. “The three men were planning to join ISIS. The three men are from Telangana and have been handed over to Telangana ATS,” said Maharashtra ATS in a statement. This week, three Mumbai youth were suspected to have joined ISIS, but were traced near Pune. Two former Indian Mujahideen members are also suspected to have joined ISIS. A 16-year-old Pune girl was also on her way to join the group before being apprehended. This entry was posted in Threats and tagged ISIS, Islam, Jehad, Jihad, Muslim Radicalization, Telangana on December 26, 2015 by arisebharat. “the formation of provinces on exclusively or even mainly linguistic considerations is not in the larger interests of the Indian nation“. Dr.B.R.Ambedkar submitted a Memorandum (dated 14 October 1948) to the Dar Commission, supporting the formation of linguistic provinces, specifically the formation of the Marathi majority Maharashtra state. To address the concern of national unity, he suggested that the official language of every province should be same as the official language of the Central Government. Opposition to Linguistic Division : K.M.Munshi, a staunch nationalist and the founder of the Bharatiya Vidya Bhavan opposed the linguistic reorganization proposal, saying that “the political ambition of a linguistic group can only be satisfied by the exclusion and discrimination of other linguistic groups within the area. No safeguards and no fundamental rights can save them from the subtle psychological exclusion which linguism implies”. The formation of any state is a very complex matter. Emotions and tempers run high especially when the issue is about division of states which were formed linguistically. The way the Congress has handled the state division of Andhra Pradesh is a manual of “How Not to Handle A State Division” . It has caused a great amount of bitterness in the people. The population of the country has grown 4 times since the time of Independence and it is natural that the local aspirations of people are growing. The government needs to re-look at various aspects of statehood demands. Leaders say that the country can be united only by emotional integration. But what is the basis of this emotion? This emotion cannot be achieved by language, there are more than 3800 dialects. This emotion can neither be achieved by caste or regionalism. It can be achieved only the basis of the Hindutva, the feeling that we are all Hindus. The size of the state can be big or small based on the above factors. But, politicians are playing with the lives of students on this. The state of Madhya Pradesh was carved into Chattisgarh & MP because they understood each others aspirations. We must realize that Akhand Bharat from Himalayas to Sri Lanka, from Kabul to the east of Chindwin river must be realized and the demarcation of states is a matter subservient to that aspiration. Forget your division and work for the same. 2. Bhimrao Ramji Ambedkar (1948). Maharashtra as a linguistic province: statement submitted to the Linguistic Provinces Commission. Thacker. This entry was posted in Hindu Dharma, Nation, Social Issues and tagged Division of states, Hindutva, RSS, Seemandhra, Telangana on February 21, 2014 by arisebharat.